Use powerful conceptual search and analysis to help you understand key facts about a case, locate key pieces of evidence, identify key custodians and profile documents for review. Provide robust tools to help you form early case strategies quickly and effectively. Enhance your ability to negotiate queries and search term lists during the meet-and-confer stage. 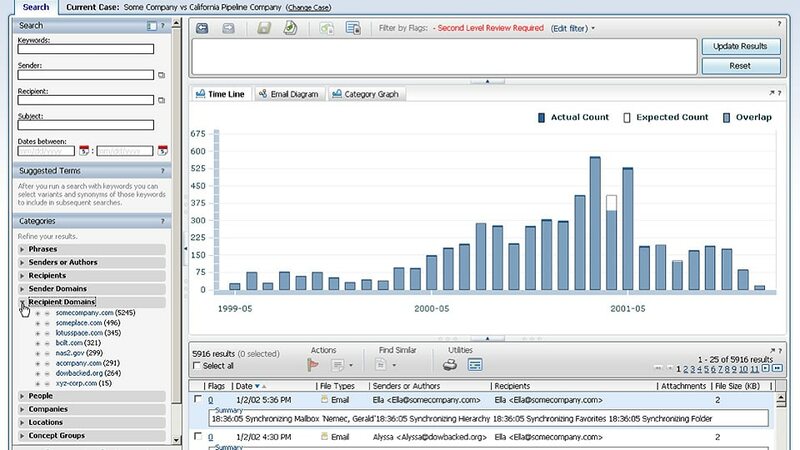 Visualize relationships between sender and receiver, and correlations between facets of evidence metadata to give you a better understanding of communication and evidence traffic patterns. eDiscovery Analyzer gives you search and analysis capabilities including auto-categorization of case information by concepts, phrases and similar and variant terms, visualization and thread analysis, near deduplication, flagging and removal of false positives. Deliver security-rich auditing capabilities by providing chain-of-custody documentation, a privilege model for case access and an audit trail for various actions. It helps you avoid the cost of failing to comply with discovery rules while engaged in litigation, investigations or audits. Quickly refine, analyze and prioritize electronically stored information to gain case insight and reduce electronic discovery review costs. The software provides advanced analytics to help you quickly identify and flag non-responsive, irrelevant and privileged content. This creates a much smaller and more relevant data set, and can help your organization dramatically reduce discovery review costs. eDiscovery Analyzer can help you avoid outside analysis costs.